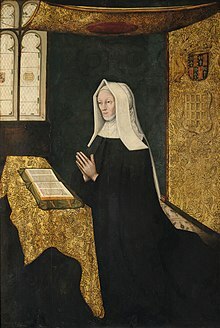 Lady Margaret Beaufort (usually pronounced: /ˈboʊfərt/, BOH-fərt; or /ˈbjuːfərt/, BEW-fərt) (31 May 1441/3 – 29 June 1509) was the mother of King Henry VII and paternal grandmother of King Henry VIII of England. She was a key figure in the Wars of the Roses and an influential matriarch of the House of Tudor. She is credited with the establishment of two prominent Cambridge colleges, founding Christ's College in 1505 and beginning the development of St John's College, which was completed posthumously by her executors in 1511. Lady Margaret Hall, Oxford, the first Oxford college to admit women, is named after her and has a statue of her in the college chapel. 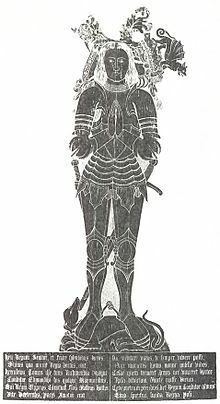 She was the daughter and sole heiress of John Beaufort, Duke of Somerset (1404–1444), who was a great-grandson of King Edward III through his third surviving son, John of Gaunt by Katherine Swynford. Margaret was born at Bletsoe Castle, Bedfordshire, on either 31 May 1441 or, more likely, on 31 May 1443. The day and month are not disputed, as she required Westminster Abbey to celebrate her birthday on 31 May. The year of her birth is more uncertain. William Dugdale, the 17th-century antiquary, suggested that she may have been born in 1441, based on evidence of inquisitions post mortem taken after the death of her father. Dugdale has been followed by a number of Margaret's biographers; however, it is more likely that she was born in 1443, as in May 1443 her father had negotiated with the king concerning the wardship of his unborn child should he die on campaign. At the moment of her birth, Margaret's father was preparing to go to France and lead an important military expedition for King Henry VI. Somerset negotiated with the king to ensure that in case of his death the rights to Margaret's wardship and marriage would be granted only to his wife. As a tenant-in-chief of the crown the wardship of his heir fell to the crown under the feudal system. Somerset fell out with the king after coming back from France and was banished from the royal court pending a charge of treason against him. He died shortly afterwards. According to Thomas Basin, Somerset died of illness, but the Crowland Chronicle reported that his death was suicide. Margaret, as his only child, was heiress to his fortune. Upon her first birthday, the king broke the arrangement with Margaret's father and granted the wardship of her extensive lands to William de la Pole, 1st Duke of Suffolk, although Margaret herself remained in the custody of her mother. Margaret's mother was pregnant at the time of Somerset's death, but the child did not survive and Margaret remained the sole heir. Although she was her father's only legitimate child, Margaret had two maternal half-brothers and three maternal half-sisters from her mother's first marriage whom she supported after her son's accession to the throne. Margaret was married to Suffolk's son, John de la Pole. The wedding may have been held between 28 January and 7 February 1444, when she was perhaps a year old but certainly no more than three. However, there is more evidence to suggest they were married in January 1450, after Suffolk had been arrested and was looking to secure his son's future. Papal dispensation was granted on 18 August 1450, necessary because the spouses were too closely related, and this concurs with the later date of marriage. Margaret never recognised this marriage. Three years later, the marriage was dissolved and King Henry VI granted Margaret's wardship to his own half-brothers, Jasper and Edmund Tudor. In her will, made in 1472, Margaret refers to Edmund Tudor as her first husband. Under canon law, Margaret was not bound by the marriage contract as she was entered into the marriage before reaching the age of twelve. Even before the annulment of her first marriage, Henry VI chose Margaret as a bride for his half-brother, Edmund Tudor, 1st Earl of Richmond. Edmund was the eldest son of the king's mother, Catherine of Valois, by Owen Tudor. Margaret was 12 when she married the 24-year-old Edmund Tudor on 1 November 1455. The Wars of the Roses had just broken out; Edmund, a Lancastrian, was taken prisoner by Yorkist forces less than a year later. He died of the plague in captivity at Carmarthen on 3 November 1456, leaving a 13-year-old widow who was seven months pregnant with their child. 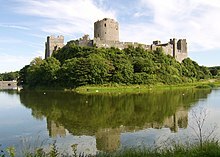 Taken into the care of her brother-in-law Jasper, at Pembroke Castle, the Countess gave birth on 28 January 1457 to her only child, Henry Tudor, the future Henry VII of England. The birth was particularly difficult; at one point, both the Countess and her child were close to death, due to her young age and small size. She never gave birth again. Margaret and her son remained in Pembroke until the York triumphs of 1461 saw the castle pass to Lord Herbert of Raglan. From the age of two, Henry lived with his father's family in Wales, and from the age of fourteen, he lived in exile in France. During this period, the relationship between mother and son was sustained by letters and a few visits. The Countess always respected the name and memory of Edmund as the father of her only child. In 1472, sixteen years after his death, Margaret specified in her will that she wanted to be buried alongside Edmund, even though she had enjoyed a long, stable and close relationship with her third husband, who had died in 1471. On 3 January 1458, the teenaged Margaret married Sir Henry Stafford (c. 1425–1471), son of Humphrey Stafford, 1st Duke of Buckingham. A dispensation for the marriage, necessary because Margaret and Stafford were second cousins, was granted on 6 April 1457. The Countess enjoyed a fairly long and harmonious marital relationship during her marriage to Stafford and they were given somewhat ruinous Woking Palace where Margaret sometimes retreated and which she restored. Margaret and her husband were given 400 marks' worth of land by Buckingham, but Margaret's own estates were still the main source of income. Their marriage bore no children. In 1471, Stafford died of wounds suffered at the Battle of Barnet, fighting for the Yorkists. At 28 years old, Margaret became a widow again. In June 1472, Margaret married Thomas Stanley, the Lord High Constable and King of Mann. Their marriage  was at first a marriage of convenience. Jones & Underwood (1993) have suggested that Margaret never considered herself a member of the Stanley family. Her marriage to Stanley enabled her to return to the court of Edward IV and Elizabeth Woodville. She was chosen by Queen Elizabeth to be godmother to one of her daughters. Following Edward's death and the seizure of the throne by Richard, Margaret was soon back at court serving the new queen, Anne Neville. Margaret carried Anne's train at the coronation. Nevertheless, Richard III passed an act of Parliament stripping Margaret of all her titles and estates, although he stopped short of a full attainder by transferring her property to her husband. While serving the new king and queen, Margaret was secretly plotting with the dowager queen, Elizabeth Woodville, and was almost certainly involved in Buckingham's rebellion. As Queen Elizabeth's sons, the Princes in the Tower, were presumed murdered, it was agreed that Margaret's son, Henry, would be betrothed to Elizabeth of York, the eldest daughter of Elizabeth and Edward IV, thus creating a marriage alliance with potential to attract both Yorkist and Lancastrian support. 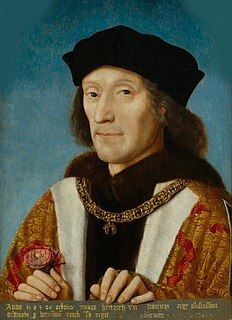 Margaret's husband Stanley, despite having fought for Richard III during the Buckingham rebellion, did not respond when summoned to fight at the Battle of Bosworth Field in 1485, remaining aloof from the battle, even though his eldest son, George Stanley (styled Lord Strange), was held hostage by Richard. 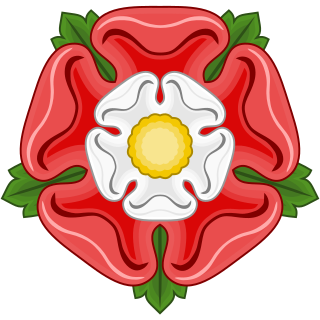 After the battle, it was Stanley who placed the crown on the head of his stepson (Henry VII), who later made him Earl of Derby. Margaret was then styled "Countess of Richmond and Derby". She was invested as a Lady Companion, Order of the Garter (LG) in 1488. During this period Margaret and the Stanley family endowed the building of chapels in Wales. Like Edward IV and his court, she was also involved with the advances in printing of William Caxton and his successor Wynkyn de Worde, not only as a patroness but for her own acquisition. The first book she commissioned from Caxton in 1483 was the 13th-century French romance Blanchardin et Eglantine, which mirrored fairly closely the match she was forging in secret between her son Henry and Elizabeth of York, with the aid of Elizabeth Woodville, then in sanctuary from Richard III in Westminster Abbey. Six years later, after Richard's defeat by Henry at Bosworth, she commissioned an English translation of the romance from Caxton: it heralded the beginning of a period of Tudor patronage. Apart from encouraging book production and building her own library, Margaret also achieved considerable success as a translator, become the first English translator of the Imitation of Christ known by name, as well as translating the fifteenth-century Netherlandish treatise The Mirror of Gold for the Sinful Soul from a French intermediary. Later in her marriage, the Countess preferred living alone. In 1499, with her husband's permission, she took a vow of chastity in the presence of Richard FitzJames, Bishop of London. Taking a vow of chastity while being married was unusual but not unprecedented; around 1413, Margery Kempe also negotiated a vow of chastity with her husband. The Countess moved away from her husband and lived alone at Collyweston, Northamptonshire (near Stamford). She was regularly visited by her husband, who had rooms reserved for him. Margaret renewed her vows in 1504. After her son won the crown at the Battle of Bosworth Field, the Countess was referred to in court as "My Lady the King's Mother". As such, she enjoyed legal and social independence which other married women could not (see Coverture). Her son's first parliament recognised her right to hold property independently from her husband, as if she were unmarried. Towards the end of her son's reign she was given a special commission to administer justice in the north of England. As arranged by their mothers, Henry married Elizabeth of York. The Countess was reluctant to accept a lower status than the dowager queen Elizabeth or even her daughter-in-law, the queen consort. She wore robes of the same quality as the queen consort and walked only half a pace behind her. Elizabeth's biographer, Amy Licence, states that this "would have been the correct courtly protocol", adding that "Only one person knew how Elizabeth really felt about Margaret and she did not commit it to paper." Margaret had written her signature as M. Richmond for years, since the 1460s. In 1499, she changed her signature to Margaret R., perhaps to signify her royal authority (R standing either for regina – queen in Latin as customarily employed by female monarchs – or for Richmond). Furthermore, she included the Tudor crown and the caption et mater Henrici septimi regis Angliæ et Hiberniæ ("and mother of Henry VII, king of England and Ireland"). Many historians believe the departure from court of dowager queen Elizabeth Woodville in 1487 was partly at the behest of Henry's influential mother, though this is uncertain. The Countess was known for her education and her piety, and her son is said to have been devoted to her. He died on 21 April 1509, having designated his mother chief executor of his will. She arranged her son's funeral and her grandson's coronation. At her son's funeral she was given precedence over all the other women of the royal family. The Countess died in the Deanery of Westminster Abbey on 29 June 1509. This was the day after her grandson's 18th birthday, and just over two months after the death of her son. She is buried in the Henry VII Chapel of the Abbey. Her tomb is now situated between the later graves of William III and Mary II and the tomb of Mary, Queen of Scots. Her tomb was created by Pietro Torrigiano, who probably arrived in England in 1509 and received the commission in the following year. The gilded bronze sculpture on the tomb depicts Margaret with her head resting on pillows and her hands raised in prayer, wearing garments characteristic of widowhood; the face was probably sculpted from a death mask. The black marble tomb is embellished with heraldic bronze insignia, including a yale, her heraldic badge, at her feet. Erasmus wrote the Latin inscription on her tomb. In English it reads: "Margaret, Countess of Richmond, mother of Henry VII, grandmother of Henry VIII, who donated funds for three monks of this abbey, a grammar school in Wimborne, a preacher in the whole of England, two lecturers in Scripture, one at Oxford, the other at Cambridge, where she also founded two colleges, one dedicated to Christ, and the other to St John, the Evangelist." In 1539 iron railings, elaborately painted with coats of arms and other ornaments, were erected around the tomb. The ironwork was sold off by the Abbey in 1823 but recovered and restored a century later. In 1497 she announced her intention to build a free school for the general public of Wimborne. Following her death in 1509, Wimborne Grammar School came into existence, to become Queen Elizabeth's School, Wimborne Minster. In 1502 she established the Lady Margaret's Professorship of Divinity at the University of Cambridge. In 1505 she refounded and enlarged God's House, Cambridge as Christ's College, Cambridge with a royal charter from the king. She has been honoured ever since as the Foundress of the College. A copy of her signature can be found carved on one of the buildings (4 staircase, 1994) within the College. In 1511, St. John's College, Cambridge was founded by her estate, either at her direct behest or at the suggestion of her chaplain, John Fisher. Land that she owned around Great Bradley in Suffolk was bequeathed to St. John's upon its foundation. Her portraits hang in the Great Halls and other college rooms of both Christ's and St. John's, accompanied by portraits of John Fisher. Both colleges use her crest and motto as their arms. Furthermore, various societies, including the Lady Margaret Society as well as the Beaufort Club at Christ's, and the Lady Margaret Boat Club at John's, were named after her. In 1502 she endowed a lectureship in divinity at the University of Oxford, first held by John Roper; it became the Lady Margaret Professorship of Divinity, held concurrently with a canonship at Christ Church, Oxford. Lady Margaret Hall, the first women's college at the University of Oxford (founded in 1878), was named in her honour. A practical woman, when faced with problems of flooding in parts of the Fens that threatened some of her properties, she was able to initiate an ambitious drainage scheme, involving foreign engineers, that saw the construction of a large sluice at Boston. She funded the restoration of Church of All Saints, Martock in Somerset, and the construction of the church tower. Margaret Beaufort Middle School (formerly Margaret Beaufort County Secondary Modern School) in Riseley, Bedfordshire, near her birthplace at Bletsoe Castle, is named after her. There is no surviving portrait of Margaret Beaufort dating from her lifetime. All known portraits, however, are in essentially the same format, depicting her in her later years, wearing a long, peaked, white headdress and in a pose of religious contemplation. Most of these were made in the reign of Henry VIII and Elizabeth I as symbols of loyalty to the Tudor regime. They may be based on a lost original, or be derived from the sculpture on her tomb in Westminster Abbey, in which she wears the same headdress. One variant by Rowland Lockey shows her at prayer in her richly furnished private closet behind her chamber. The plain desk at which she kneels is draped with a richly patterned textile that is so densely encrusted with embroidery that its corners stand away stiffly. Her lavishly illuminated Book of Hours is open before her, with its protective cloth wrapper (called a "chemise" binding), spread out around it. The walls are patterned with oak leaf designs, perhaps in lozenges, perhaps of stamped and part-gilded leather. Against the wall hangs the dosser of her canopy of estate, with the tester above her head (the Tudor rose at its centre) supported on cords from the ceiling. The coats-of-arms woven into the tapestry are of England (parted as usual with France) and the portcullis badge of the Beauforts, which the early Tudor kings later used in their arms. Small stained glass roundels in the leaded glass of her lancet windows also display elements of the arms of both England (cropped away here) and Beaufort. Iris Gower, Destiny's Child (1999). This novel was originally published in 1974 as Bride of the Thirteenth Summer, under the name Iris Davies. The character of Lady Margaret, portrayed by Marigold Sharman, appears in eight of the thirteen episodes of the BBC's Shadow of the Tower (1972) with James Maxwell as her son Henry VII. She is portrayed as a woman of extreme ambition and piety, with a hint of ruthlessness for those who stand in the way of the Tudor Dynasty. Channel 4 and RDF Media produced a drama about Perkin Warbeck for British television in 2005, Princes in the Tower. It was directed by Justin Hardy and starred Sally Edwards as Lady Margaret, opposite Paul Hilton as Henry VII, Mark Umbers as Warbeck, and Nadia Cameron Blakey as Elizabeth of York. In this drama, Margaret is depicted as the power behind the throne, a hardened woman of fanatical devotion to both God and herself. She is referenced as a victim of abuse and power, who, used by men all her life, became as ruthless and callous as those around her. In 2013, Amanda Hale portrayed Lady Margaret Beaufort in the television drama series, The White Queen, an adaptation of Gregory's novels, which was shown on BBC One, Starz, and VRT. In the 2017 series The White Princess (a followup to The White Queen), Margaret is portrayed by Michelle Fairley. ^ Jones & Underwood, 34. ^ Jones & Underwood, 35. ^ Jones & Underwood, 33–36. ^ Gristwood, Sarah (2012). Blood Sisters. p. 36. ^ a b c Jones & Underwood, 37. ^ Richardson, Henry Gerald, Sayles, George Osborne (1993). The English Parliament in the Middle Ages. Continuum International Publishing Group. ISBN 0-9506882-1-5. Retrieved 25 July 2009. ^ Wood, Diana (2003). Women and religion in medieval England. Oxbow. ISBN 1-84217-098-8. Retrieved 25 July 2009. ^ Jones & Underwood, 58. ^ Westminster Abbey: Coronation of Richard III, westminster-abbey.org; accessed 17 August 2013. ^ Elizabeth Norton (1 June 2012). Margaret Beaufort: Mother of the Tudor Dynasty. Amberley Publishing Limited. pp. 35–. ISBN 978-1-4456-0734-4. ^ Jones & Underwood, 187. ^ Barbara J. Harris, "Women and Politics in Early Tudor England", The Historical Journal, 33:2, 1990, p. 259. ^ his story, her story: Interview with Amy Licence, 1 February 2013; accessed 19 August 2013. ^ Jones & Underwood, 292. ^ Arlene Okerlund, Elizabeth: England's Slandered Queen, Stroud: Tempus, 2006, p. 245. ^ Rosemary O'Day (26 July 2012). The Routledge Companion to the Tudor Age. Routledge. p. 5. ISBN 978-1-136-96253-0. ^ "Margaret Beaufort". Westminster Abbey Official site. Retrieved 22 August 2013. ^ Wyatt, Michael, The Italian Encounter with Tudor England: A Cultural Politics of Translation, Cambridge University Press, 2005, p. 47. ^ a b c "Lady Margaret Beaufort". Westminster Abbey. Retrieved 24 June 2016. ^ Jo Ann Hoeppner Moran (14 July 2014). The Growth of English Schooling, 1340–1548: Learning, Literacy, and Laicization in Pre-Reformation York Diocese. Princeton University Press. pp. 162–. ISBN 978-1-4008-5616-9. ^ Charles Henry Cooper (1861). Memorials of Cambridge: St. Peter's College. W. Metcalfe. pp. 9–. ^ "Lady Margaret Professorship of Divinity, Christ Church, Oxford" (PDF). University of Oxford. Retrieved 23 June 2016. ^ Michael K. Jones; Malcolm G. Underwood (22 April 1993). 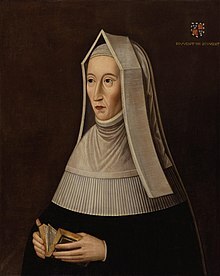 The King's Mother: Lady Margaret Beaufort, Countess of Richmond and Derby. Cambridge University Press. pp. 13–. ISBN 978-0-521-44794-2. ^ Profile, historytoday.com; accessed 24 March 2016. ^ Robinson, W.J. (1915). West Country Churches. Bristol: Bristol Times and Mirror Ltd. pp. 6–10. ^ The Burlington Magazine. Burlington Magazine Publications Limited. 1908. p. 206. ^ Neil D. Thompson and Charles M. Hansen, The Ancestry of Charles II, King of England (American Society of Genealogists, 2012). Jones, Michael K. & Underwood, Malcolm G. (2004). "Beaufort, Margaret [known as Lady Margaret Beaufort], countess of Richmond and Derby (1443–1509), royal matriarch". Oxford Dictionary of National Biography (online). doi:10.1093/ref:odnb/1863. Wikimedia Commons has media related to Lady Margaret Beaufort. Chisholm, Hugh, ed. (1911). "Richmond and Derby, Margaret, Countess of" . Encyclopædia Britannica (11th ed.). Cambridge University Press. "Lady Margaret Beaufort and the Art of the Book". Cambridge University Library. Retrieved 24 June 2016.